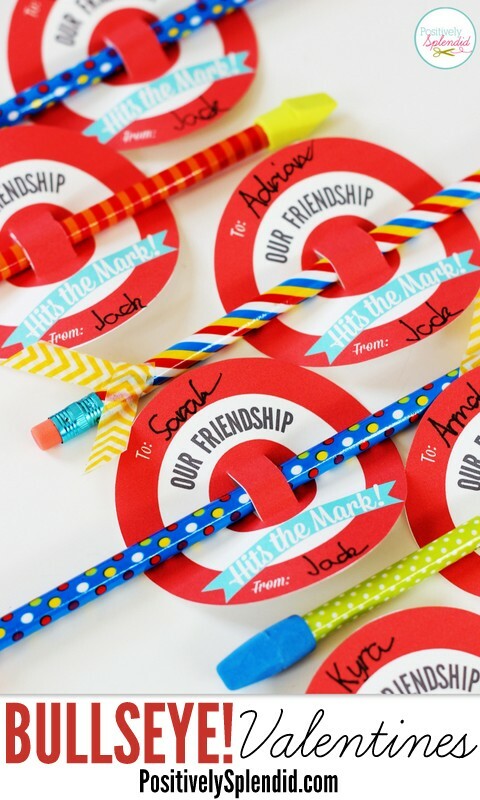 As a mom of a boy, it can be challenging to come up with Valentine’s Day classroom ideas that aren’t overly sentimental or mushy. 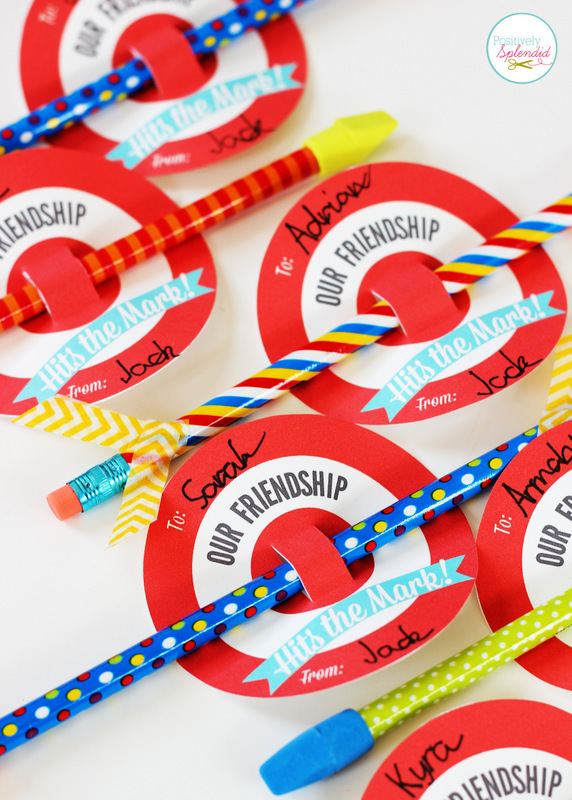 Today’s printable valentine idea is one that is terrific for boys or girls. 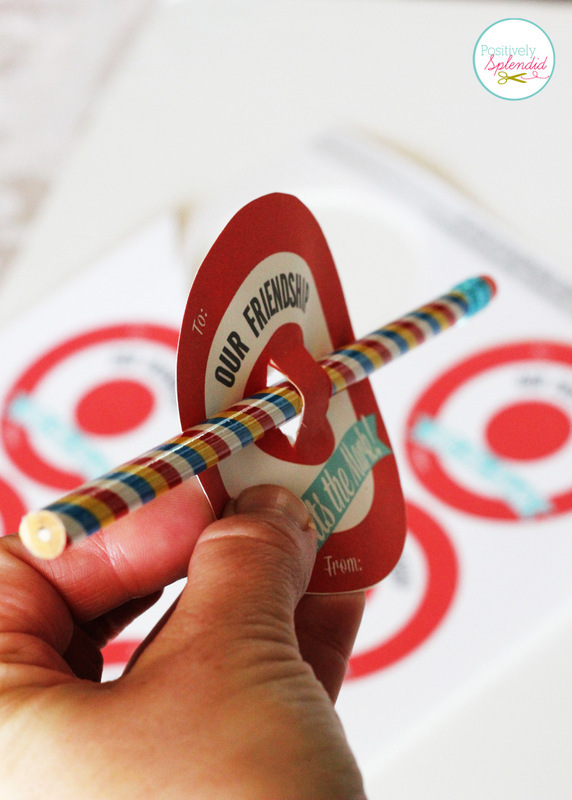 These bullseye valentines, which feature a pencil outfitted as a cute arrow, are sure to hit the mark with any recipient, and parents will love that they are 100% candy-free! So grab you little helpers, and let me show you how easily these come together. 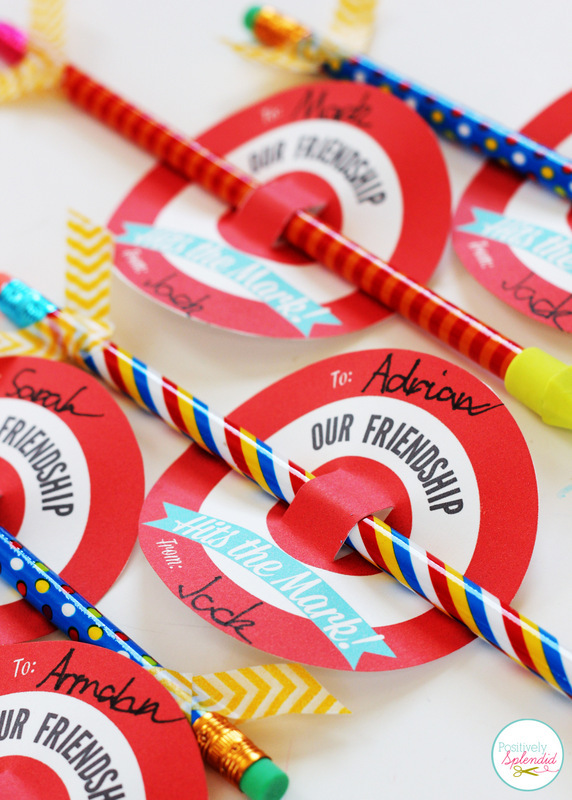 Bullseye Valentine Printable << Click link for free download. 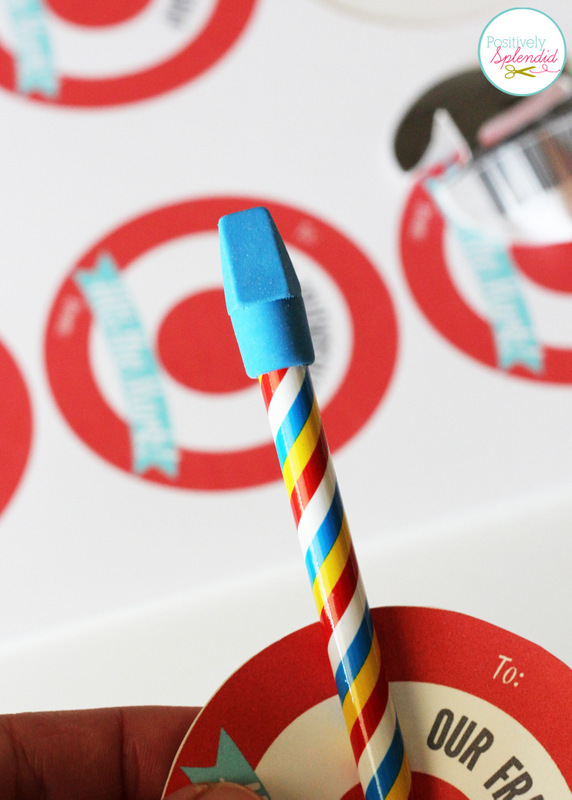 Download and print the bullseye printable onto the white cardstock. 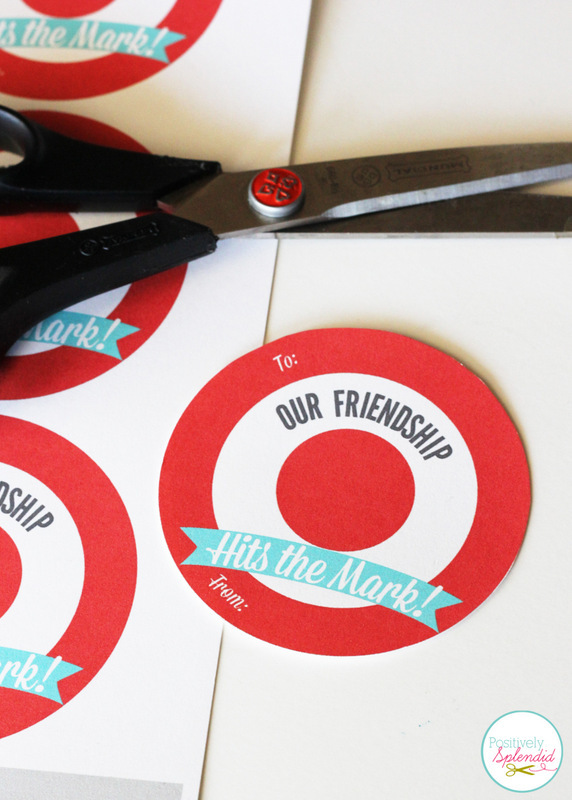 Use the scissors to cut each bullseye shape out. With the craft knife, make two 3/4″ vertical slits that are about 1/2″ apart through the center portion of each of the bullseye shapes. Slide a pencil through each pair of slits, as shown. …and washi tape “fletching” on the other end. 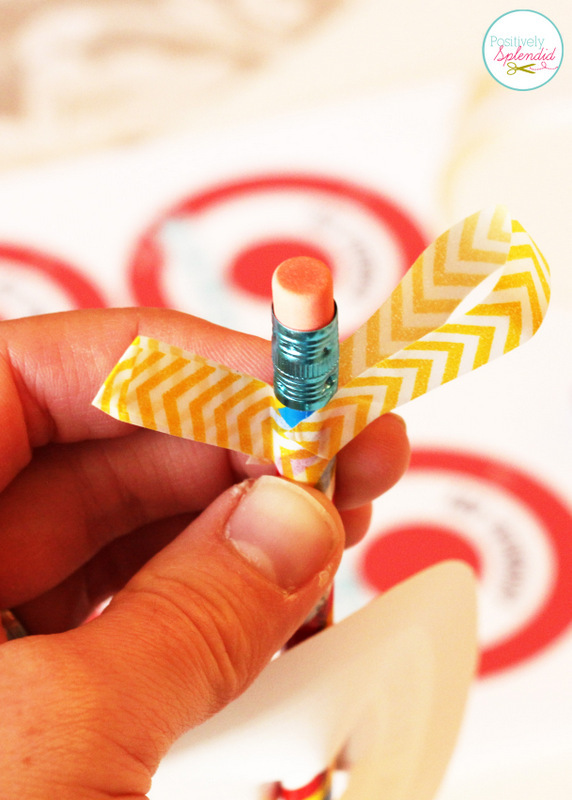 To create the fletching, cut 2 approximately 3″ pieces of washi tape, and fold each along either side of the eraser end of the pencil, as shown. Trim each folded piece at an angle for an authentic look. So easy to make and fun to receive, this is a classroom valentine that is sure to be a hit with kiddos and parents alike! …and I love that this is a project that kids can take a major part in, as each and every step is achievable for crafters of any skill level! 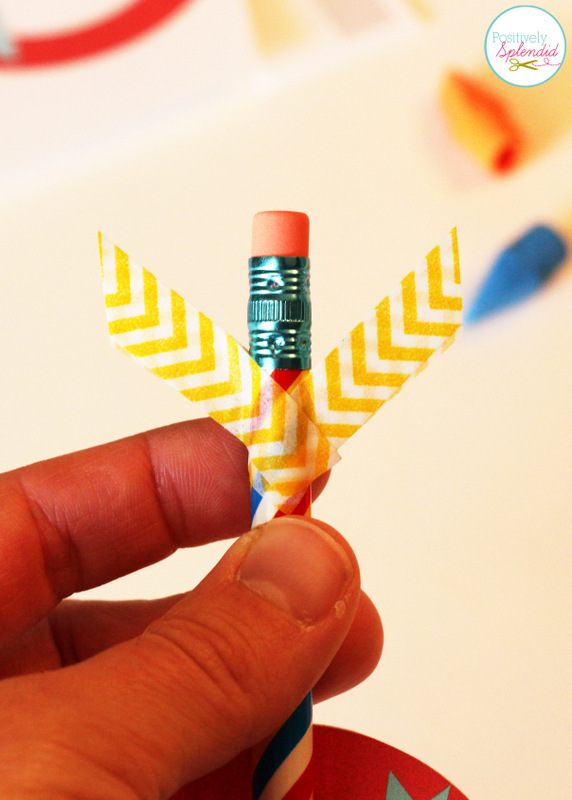 Love the pencil arrow concept? 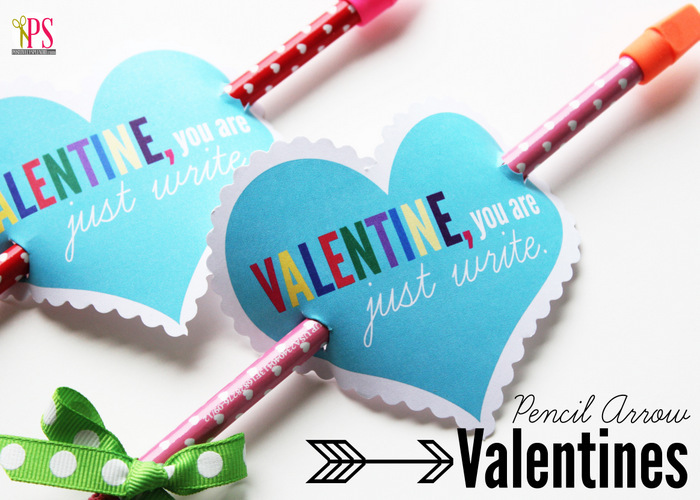 Be sure to also check out these cute Pencil Arrow Valentines. 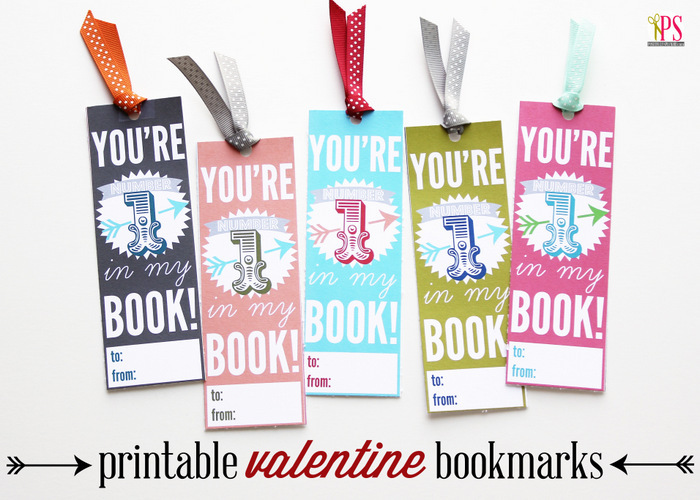 And the little bookworms in your life are sure to love these Printable Valentine Bookmarks! AHHH! These are so adorable! 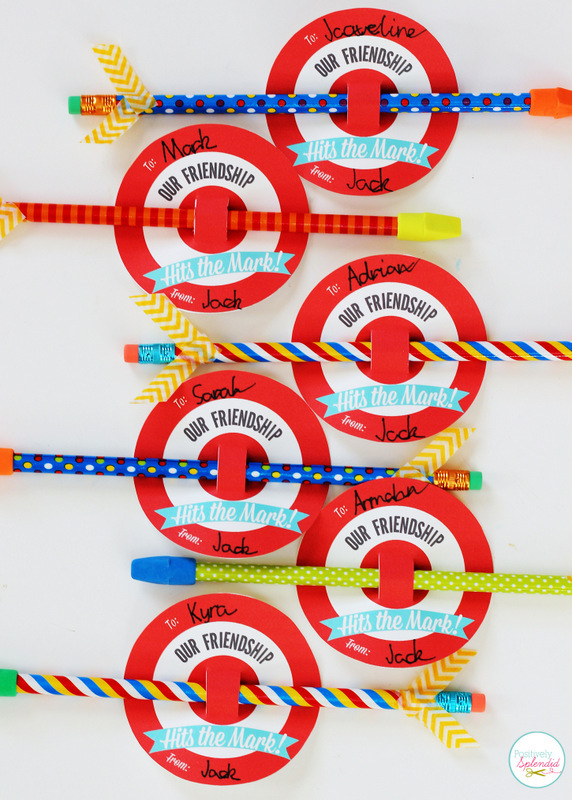 Practical, cute and great for those times when you’d rather not give out candy. Lots of schools don’t seem to let you bring edibles to school parties at all anymore. Something like this would be perfect! Oh my Amy! 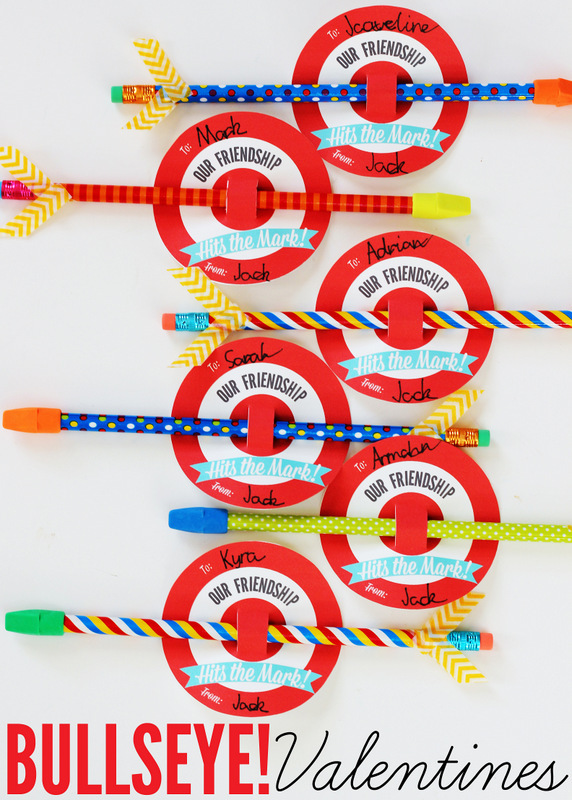 These are darling and so clever! Pinning! hi! 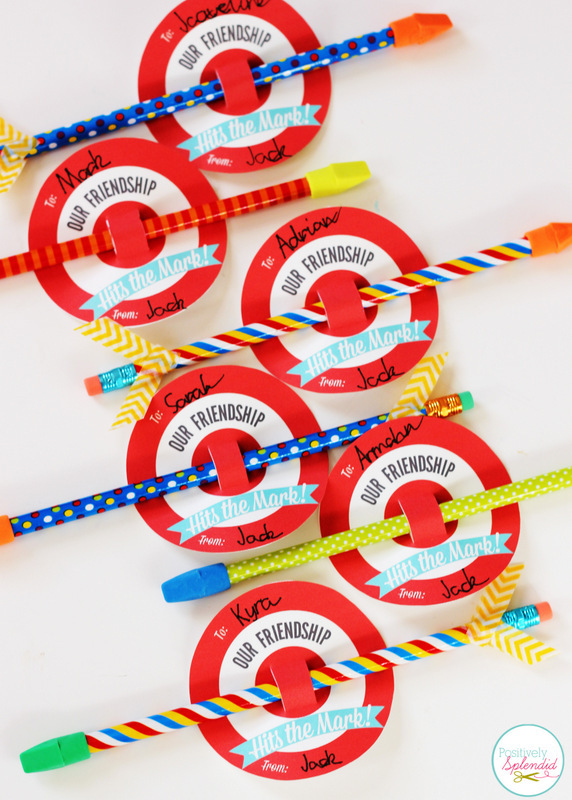 i just loved the bullseye printable! i will do them for my son’s kindergarten friends. where do you buy the pencils? thanks a lot! Hi, Lissy! I found the pencils at Target in their dollar section. Thanks for visiting!